What an outstanding example of a progressive group that is taken seriously by the powers that be. Godspeed, TransitMatters (but please push the NSRL - - then you wouldn't have to worry about the capacity at South Station). ".........It’s also unclear whether the T would have enough room for all these trains. TransitMatters suggested the T could boost capacity at an already crowded South Station by turning trains around every 13 to 20 minutes. The T says it is already hitting that turnaround rate during peak periods with most trains, but TransitMatters believes there’s still room for improvement...."
Gee, I wonder WHAT ON EARTH can solve that problem?????????? "The group said its ideas would not require the North-South Rail Link, the proposed tunnel under Boston that would connect North and South stations, but still supports the idea." Hey, I love the beautiful restaurant you envision, but where is the kitchen? If anyone here is from TransitMatters, may I politely ask for an explanation? I understand you "support" the NSRL, but then cut it at the knees by saying it is not critical to your plan. That will only give Baker room to table NSRL and treat the symptom but not the cause (if he does even that). Last edited by shmessy; 02-28-2018 at 06:51 AM. I can't speak for them, but I understand the reasoning for taking that position. They are proposing an incrementalist approach that nevertheless arrives at a full fledged system. They start by pushing hardest for the lowest hanging fruit: by utilizing an essentially electrified Providence line and making the low cost investment to electrify Fairmont, we can justify a modest capital purchase of EMU sets during normal replacement cycles. So basically we get two EMU lines for minimal cost that can then serve as a proof of concept (think Everet bus lanes as an example of how that works). Ultimately, I suspect they will indeed push for NSRL, but for the moment, they want to prove on the cheap that EMU + level platform boarding + better organization can be transformative. Once that is clearly demonstrated, we push for the more substantial investments, up to and including NSRL. Hey there. I'm the lead board member/project coordinator (and also graphic designer) for the Regional Rail campaign. Henry basically summed it up. All of us support NSRL, but don't want this new business model to get bogged down by one controversial capital project. This is an over-arching widespread vision for a vast modernization & rethinking of Commuter Rail and not about singular capital projects. 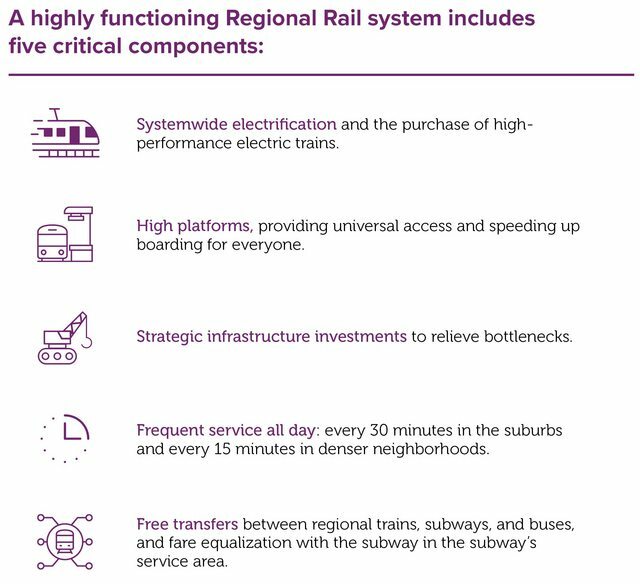 You can have Regional Rail network with the 5 critical components we outline (below) without having the NSRL, which is the point the report/executive summary makes. You can do electrification, high platforms, fare integration, double tracking & more frequent service without the NSRL and have a pretty decent Regional Rail network just with not as frequent service or convenient transfers. Ultimately, the NSRL is the key to unlocking the full potential of Regional Rail, but we could not go all in on it if we wanted it to be taken seriously by the people who matter in the MA Government. Earlier versions of the report leaned on NSRL and it was received rather negatively by key stakeholders who wanted to support us. As a result of the changes/toned-down language, they are content with the report now. Last edited by datadyne007; 02-28-2018 at 09:41 AM. They start by pushing hardest for the lowest hanging fruit: by utilizing an essentially electrified Providence line and making the low cost investment to electrify Fairmont, we can justify a modest capital purchase of EMU sets during normal replacement cycles. So basically we get two EMU lines for minimal cost that can then serve as a proof of concept (think Everet bus lanes as an example of how that works). EMUs have traction motors installed in the trucks. Actual low hanging fruit would be to figure out how to also install Tesla battery packs in the trucks, and replace the trucks on all of the existing coaches so that the entire fleet becomes battery EMUs. Yes, there's probably a bit of truck and suspension engineering to do here, but it's got to be a lot less work than figuring out how to redo every single bridge that carries a road over the commuter rail system to add clearance for the 25kv power lines. (Remember how the NIMBYs worked out with Fitchburg line upgrades? Or the 28X bus improvement? We're going to have that sort of thing all over again on a few bridges if someone insists upon forcing adequate clearance everywhere for 25kv lines.) And once you realize that there's less total engineering with battery EMUs than redoing all the bridges, why have weird trains that require 25kv lines that will only work on the Providence Line? EMUs have traction motors installed in the trucks. Actual low hanging fruit would be to figure out how to also install Tesla battery packs in the trucks, and replace the trucks on all of the existing coaches so that the entire fleet becomes battery EMUs. https://electrek.co/2018/02/28/tesla...epayers-money/ discusses how Irvine Ranch Water District in California expects to save money by installing Tesla batteries; could MWRA save money in a similar fashion? I think someone just bought some Tesla stock. No. You cannot add features, cost, and risk to the low-hanging fruit and still call it low hanging. Low hanging fruit hangs low precisely because it taps things that are low cost & low risk (off the shelf, quick to deploy) to produce large, fast, predictable returns. 1) Organization before Signals/Electronics before Concrete. 2) Frequency is the leading attribute, not through running. If you can get increased frequency and shorter trip times with faster acceleration (electrification) and shorter dwells (high platforms, all-door boarding), you SHOULD. The imperative is to deliver all the mobility you can as soon as you can. Last edited by Arlington; 02-28-2018 at 10:27 AM. I would have loved to see an appendix with data supporting the notion that trains can be turned faster at South Station. Where this group has had its greatest successes (scrapping the Auburndale design and re-timing the Park Street release come to mind), it's been able to point to incontrovertible data saying either "this will make things worse" or "there is a better way to do this than we're doing now". They mentioned that faster turns happen at outer terminals than at South Station, but that seems to make intuitive sense if only because of smaller boarding/alighting numbers. Unfortunately the point about turns wasn't strongly supported in the report, so naturally the kneejerk response from the T was "we think we're doing it as fast as we can." If something is forthcoming to prove that that's not the case, it follows that there would be actual movement on this, because the powers that be would truly have no other choice. That said, a solid start to the conversation, with all kudos due for getting the conversation going before the state has had a chance to deliver a dud. Many thanks. We are currently working on that supplement right now actually because it's where we're getting some targeted pushback. The report was largely written by our technical committee and then the language and tone adjusted to appeal to the broadest base possible. I will try to post some clarification for you soon on here. They seemed to have the confidence to say that you could start turning trains in 20 minutes at South Station tomorrow. Tip o' the hat to you, Data. Incredible work. And it's exciting to see you folks are playing your cards smartly enough to have gained a foothold with the powers that be. It's easy for someone like me here to jabber into the wind. You are actually making inroads. Keep it up! "It’s also unclear whether the T would have enough room for all these trains. TransitMatters suggested the T could boost capacity at an already crowded South Station by turning trains around every 13 to 20 minutes. The T says it is already hitting that turnaround rate during peak periods with most trains, but TransitMatters believes there’s still room for improvement." The reply by the T in that paragraph seems to indicate they don't share the same level of concern. Last edited by shmessy; 02-28-2018 at 12:20 PM. If the only thing that comes out of this is the electrification of the Providence and Fairmount lines, that would still be a huge win. Tip o' the hat to you, Data. Great, great work!! And it's exciting to see you folks are playing your cards smartly enough to have gained a foothold with the powers that be. Most of us here are jabbering into the wind and you are actually making inroads. Keep it up! Thanks. That was really the challenge/decision at hand: Do we want this to be a pie in the sky manifesto of a vision that only the railfans will understand/support or do we want to hone this in as a business model? Chairman Joe Aiello's comment at the FMCB meeting in November (too much money for too little ridership) really helped make that critical decision of the direction of this report. Credit goes to fellow board member and fmr. MA Transportation Sec Jim Aloisi for really refining this Regional Rail as a business model approach in order to speak as clearly to the politicians and government officials he knows personally and professionally. The report (and 5 critical components) is a solid business model that you could take and apply to any rail network around the world. The NSRL is not something that is part of the overall business model. It's a customization of the model for Boston's network only and that's what our report/exec summary seeks to clarify. Some of the media are still too obsessed with the NSRL and are trying to tie us to it simply because we mention it, but for the most part, our tone and message is getting across well. My question is "what could be the remaining, tangible, solution to that particular point?" If that is a key issue, then what other solution is there but for the NSRL or the wasteful SST expansion? And yes, as I said above, we are working on a supplement to further clarify that data. We also did some preliminary cost calculations for the Providence Line for the ProJo last night. Credit to Colleen Dunning for adding that piece. I will pass on your feedback to her. Bingo and that's the key to the incremental approach. You can do it as quickly or slowly as you want. We've given you (them) the business model now. Are these the same folks that provided data showing a single E-line train was holding everything up at night and the MBTA responded with "impossible"? Yup. That was mainly Marc (our founder) and our member Ari Ofsevit (The Amateur Planner) who processed and analyzed the data from a couple sources listed in the piece. I also liked the report. In the vein of organization before electronics, I would strongly encourage MassDOT to fully re-brand the service sooner rather than later. As noted in the report, the mindset of "transit is transit, Commuter Rail is Commuter Rail" will slow the progress of movement to a regional rail system. The name "Commuter Rail" is part of the problem and it is pervasive throughout the system. It continually reinforces the 9-5 commute idea of the service. Incidentally, wouldn't you want to electrify Stoughton as well? It's only 5 miles or so of single track, isn't it? One would get extra flexibility in being able to send electrics down there as well for not too much extra cash. And we're supposed to do concrete after electronics, right? And sticking batteries into the trucks next to the traction motors is electronics which we're supposed to do before concrete, right? Yes of course. In fact, Stoughton is part of the appendix section on that corridor (C1: Providence/Stoughton). sticking batteries into the trucks next to the traction motors is electronics which we're supposed to do before concrete, right? No, "sticking batteries" is some kind of non-railroad function not anticipated by German railway theoreticians, that can't be crammed into their model. Sticking is probably not simply a question of double-sided tape as the term would make it appear. Even if you promised to lash them to the frame with signal wire, I would not let you count it as "signal/electronics"
We're talking both a physical mounting and systems integration, similar to what's caused all the headaches with even the conventional, service-proven components that were "stuck" together to make the HSP-46. And then, if you jigger the frame, you're probably off to the FRA for crash testing. And batteries, though obviously promising, involve the risks of not being a service-proven, off-the-shelf, FRA-compliant thing, and therefore beyond the scope of the T or MassDOT to invent/contrive. The T may be faulted for its "not invented here" attitude, but I'm not going to fault them for a "not invented yet" veto. You are free to one-up transitmatters with a plan of your own, but the virtue of the transitmatters plan is that it marshals repeatable operating practices and very normal long-proven tech that's easy to procure in a competitive-bid process and delivered on predictable timetables. Last edited by Arlington; 02-28-2018 at 05:20 PM.